As most photographers will probably agree, you never get tired of seeing your work published. So I looked at it for a while and a thought crossed my mind. How did this image get to be on the website? You might answer, well, that’s easy. A designer at the paper found it at a stock agent and licenced it. End of story. You would indeed be correct with that statement but my idea goes back further to what happened before I even pressed the shutter button. What decisions made me take the picture, why did I frame it like that, why did I submit this image to a stock agent, etc. Decision: Do I photograph the pier? Interest in piers can come from many directions, there is always a demand for images as piers are quite iconic structures and can define a location. Age though brings on deterioration and many have disappeared over the years. These once popular Victorian structures will never be recreated so in the future they will become a rare sight on the coasts of the UK. One of the rules I apply to taking a stock photograph is if I can identify 5 markets that could make use of that image. Here I can count UK travel, Victorian history, building, UK coastlines and business as most piers are designed to attract customers. So, as you can see there are likely to be a reasonable demand for an image like this one at Bognor. Decision: What camera do I use? This is an update to the original article as now, you can take pictures on your phone and sell them as stock. So, do you use your phone or do you use your DSLR/Mirrorless (delete as appropriate) camera? This depends on how yuo expect to licence the image. If you think it's only going to a phone stock site then that's the end of that, next decision, but if you are submitting to the more traditional libraries then they are going to want the best quality image you can come up with. Indeed, some will have allowed-camera lists so you have to take the picture on an approved device or that picture's not getting in! Make that decision and move on. Decision: Is the light good enough? If you are taking a landscape image there are many suggested times for the best light. Sunrise and the golden hour of sunset are very popular times as the light is wonderful. However on the day I was there I only had the light of the middle of the day to work with, which is not ideal. Still, as so often happens in the UK, it could have been raining so I was grateful I had a cloudless blue sky to form my backdrop. The position of the sun forced my hand as to which side of the pier that I would photograph. Had I tried to shoot from the other side I would have been facing the sun meaning, at best a white sky and at worst a lot of undetailed shadow as the exposure would have been so short. This is a shame because I wanted to work with the other side of the pier to make use of some wonderful old fishing boats in the foreground which were pulled up on to the beach. Perhaps if I return I could go at a better time of the day and predict where the sun will be. So I positioned myself to the right of the pier to make the most of the light on the pier and the blue sky behind. If I had been there in the rain I may have been able to take some atmospheric shots but an image of the pier is more likely to sell if it’s photographed in a flattering light and although not it’s most atmospheric at least it was a nice, warm, sunny summers day. You don’t see many travel articles using images of places photographed in bad weather. However you never know if someone might want a shot taken on a dull, dreary, even rainy day so I'd still take the shot. Decision: How do I frame the picture? Piers are associated with the sea so the image really needs to show both. I stood in a location that gave me a good side view of the pier and a reasonable part of the sea too. If I moved too close to the pier the angle would have reduced and so there would have been less pier and more sea. The picture is all about the pier so the detail and structure were important features. Had I moved closer the angle would have changed the mood and perhaps added some drama. There is likely to be a demand for images like this too but I didn’t have enough time to spend working on those on this occasion and was satisfied with more of a documentary image. Within the framing decision are further ‘sub-decisions’ such as how much foreground, where do I put the horizon and how much detail left and right do I include? Answer: Foreground was easy here as there was only the beach but within that there was a breakwater. This added a little foreground interest and broke up the monotony of the pebbles so it was worth stepping back to include it. I framed to include only the pier and none of the buildings to the left of the frame. This dictated how much of the sea would be featured to the right of frame too. So as you can see I had to manoeuvre about in this particular spot to find agreeable amounts of the pier, the sea, the breakwater and the beach before I settled on my composition. Decision: Where do I put the horizon? There is lots of advice about the ‘rule of thirds’ which would advise that the horizon goes on one of the two imaginary horizontal lines that dissect the frame in the ‘thirds rule’. I always consider this rule when framing a shot as it can improve the visual effect greatly however I ignored this rule on this occasion as it would have meant either too much sky or too much beach and I didn’t want that so the horizon was placed down the middle. This still leads to a pleasing composition. Decision: What exposure should I use? As the day was nice and bright I had a wide choice of exposure settings to choose from. This is a stock picture of a pier so I would want to ensure that as much of the image from front to back is in focus. 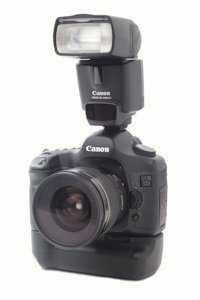 This meant that, on a 20mm lens, a good aperture to achieve this would be something like f11 or smaller. As I was hand-holding I needed a reasonable shutter speed to avoid camera shake. 1/40th was as slow as I was prepared to go. Using ISO 50 meant I got the best quality image possible but I could have stepped it up to ISO 100 and used a faster shutter speed of 1/80th with a barely noticeable loss of quality. Clients always want an image at the highest quality and no noise. By shooting at low ISO’s you are ensuring that this is not a problem. Of course there are occasions when the image may benefit from noise as this can also add drama but as this image is all about photographing the pier in a documentary kind of way, detail is important. Final exposure 1/40th @ f11. ISO 50. Decision: People, do I include any in the shot? Apart from the tiny specs of people on the pier there are no recognizable people in this image. Including people in stock photographs is a highly debated topic leading to discussions about trying to obtain model releases for those in the photograph. By asking for anyone in the shot to sign a release you are reducing the risk of a court case bought by someone who featured in a picture and for one reason or another, is not happy about it. As it would be very, very difficult to obtain a release from the many holiday makers who could be in this shot, I took it when the beach in front of me was empty. Had I been in Brighton waiting to do the same thing I would have been there a long time, but on this occasion this part of the beach was devoid of people. One administrative nightmare avoided. I always shoot in raw as this captures the most information from the scene and makes it available to you to work with in your post-processing. A Jpeg is designed to be compressed and this act of compression reduces the amount of information you can retrieve. When you post-process a jpeg it will never offer you as much to work with as the raw file. Decision: Before I walk away, do I photograph the scene in portrait format as well? Yes. Always give your client the opportunity to choose a portrait format or a landscape format of the scene. One shape is more likely to fit the layout of their design better than another. By providing both you are increasing the chance of a sale. So now I have the image captured in the camera. Still that’s not job done. I have to make further decisions during the post-processing stage and how the image finally becomes available as a stock image for a client to licence. In post-production I have a myriad of choices to adjust the exposure, the crop and white balance and these are just the options I have with the manufacturer’s image processing software. So what is the first decision? I only process an image if it’s sharp. Stock libraries do not allow unsharp images so I can save myself a lot of time by viewing the image at 100% before I start to ensure there are no sharpness issues. You should be able to tell if an image is sharp or soft before any sharpening is applied. If the image is soft then no amount of sharpening in post-production will save it. Get your focus right when you take the picture. In an image like this it is important there are no blown highlights and no shadow lacking detail. If your image is poor in these areas you can bet that another photographer will have produced an image without those defects and the buyer will always use that image. Why use one lacking detail when there are plenty to choose from that do? Ideally a blue sky with fluffy clouds provides a perfect backdrop to most scenes. I don’t photograph landscapes when the sky is blank, grey and without detail. (Unless of course that is the effect I need OR I have no choice but to do so.) A flat lifeless sky reduces the impact of your picture dramatically. A stock photographer has to develop the skill of knowing as much when not to take a picture as much as when to take it. I like an image with detail in the sky and here in our example the best we could do was make best use of the blue sky, albeit cloudless. As the sun provided me with the light from behind and to the right of camera, the whole scene received the same amounts of light thus reducing shadow areas lacking detail. The image passed the exposure decision. Adjustments to contrast, shadow and highlights affect the final image so these have to be adjusted with care to ensure an accurate finished image. Remember this is a documentary-type shot so its use will almost always require an accurate rendition of the scene. Decision: Is the framing ok? If I wanted to I could crop the image to emphasise different parts of the scene, more pier less beach, more beach less sky, etc but all of this means a smaller image with less detail. Most of my framing decisions were made with the camera to my eye so any crop adjustments at this stage are going to be minor. My final decision was to crop a small amount around the outside removing some unwanted detail on the edges of the frame. When a designer is using an image in a layout, an image which is too tightly cropped reduces their choices when wishing to make their own cropping changes to fit in that image or maybe they want to add some text over the top as part of an article so leaving some space around the picture will also make it more attractive to a buyer. Decision: Do I need to adjust the white balance? One of the beauties of shooting raw is that the white balance can be adjusted in post-production. I tend to leave the camera set to ‘cloudy’ as this works for many scenarios and any adjustment that is required is easily handled at this point. No white balance adjustment was needed. Now the image is almost ready I will save it in the ‘tif’ format. Tif is lossless and unlike jpg’s does not lose any detail in repeated saving actions. Tif’s retain their detail because they are not compressed. I never save an image at this stage as a jpg. Decision: Are there any dust spots? Sadly yes. Stock libraries expect their images to arrive spot-free and clients also want them clean so I have a little bit of work to do tidying up the marks. It’s always a matter of pride for me to provide clean images. As a photographer you do not want a reputation for loading spot-laden images. I work on the tif image in my chosen picture editor with the cloning tool until the spots are removed. Any clone work of this nature must leave the picture as if the spot was never there. Obvious spotclean- up cloning is likely to lead to a rejection by a stock agent before it’s allowed in to the collection. Decision: Now the exposure and framing are sorted, do I sharpen it? Some stock agents stipulate unsharpened images, others don’t mind. If you do sharpen the image however, any sharpening artefacts that are created as a result of this action will mean rejection by any stock agent you send it to. Sharpening must be undertaken with care. I always save an image as unsharpened then if I need to sharpen it I can then save a different, sharp version. Saving an unsharpened ‘master’ copy means I can sharpen later if needed. I can’t un-sharpen an image once it has this process carried out upon it. For this image that is all of the post-processing I am going to do. As it’s a documentary shot I need it to be an accurate rendition of the original scene. Decision: Which stock type, rights managed or royalty-free? There are many factors that affect my decision as to which stock ‘pot’ I put an image in to. On this occasion I am going to choose rights-managed, ( or RM), as it features recognisable property. RM will ensure a controlled use for each licence purchased. If it were submitted as a royalty-free, (or RF), image a buyer could use it without any control and forever more once they buy that RF licence. Now I upload the image to my stock agent. For more information about licencing see another of our articles here. Lets assume that the image passes the inspection process at the stock agent. My first job is to add the description. This must accurately describe the image to any buyer. It’s also important to add the date the image was taken as a structure of this nature can change in the future. A buyer may be looking for the shot from a certain period of time. I then have to keyword it to ensure that it is found by perspective buyers looking for an image just like this one. Stock images are found by searches using words that identify the image equired. If you get this stage wrong, nobody will find your work and all the effort that goes in to creating your shot will be wasted because you failed to keyword it properly. What I have to do here is identify the words that best identify the contents of the picture in a way that buyers might try to find it. 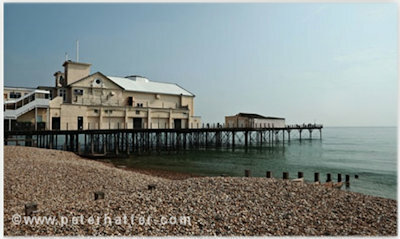 I used words like Bognor regis, pier, coast, holiday destination, victorian, sunny, UK, beach, pebble, breakwater, blue sky. As you can see these phrases describe the picture and it’s contents in a very literal way and that’s how most buyers will look for it. I will also add phrases like “landscape format” to describe the shape and “copy space” because there is clear empty space around the frame that a designer can use to add their own text. Adding the wrong keywords can penalise your picture on the stock site as it will be found in searches but never downloaded because it is not what is required. So as you can see keywording needs to be done with care. All advice contained in the article is for reference only and comes with no guarantee or warranty whatsoever. What you choose to photograph and how you use those images is entirely your responsibility. Peter Hatter Photograpy Ltd. cannot be held responsible for any dispute or legal action that may arise as a result of reading this article. Please see legal for further terms and conditions of use. Copyright 2015 Peter Hatter Photography Ltd.
Shoot,upload,repeat is the mantra of many a stock photographer who aims to make as much money as possible from their images. It's also often said that stock images earn you money whilst you sleep. See how that's possible here. Working with clients and providing them with a professional service to shoot the images they ask you to supply to them is what Commercial photography is all about. See what's involved here. You can spend a lot of money on gear to create work to sell or you can spend nothing on camera equipment and still create work to sell. Lets see what the options are here.